We have seen many stories involving strange relationships between man and animals. But the story of Hiroyuki and Yoriko is one of the strangest we have ever seen. Hiroyuki has been a very good friend of Yoriko an Asian sheepshead wrasse for more than 2 decades! Hiroyuki is a scuba diver for decades, he is very fond of exploring the waters of Hasama Underwater Park. 25 years ago, he found a wounded sheepshead wrasse that he would later name Yoriko. The fish is nearly dead and in dire need of help. Hiroyuki did what is right and aided Yoriko in her recovery. Hiroyuki feeds her crabs and smaller fishes and since then, they became very good friends. Scientists found out that Asian sheepshead wrasses exhibit higher intelligence compared to other species of fishes. 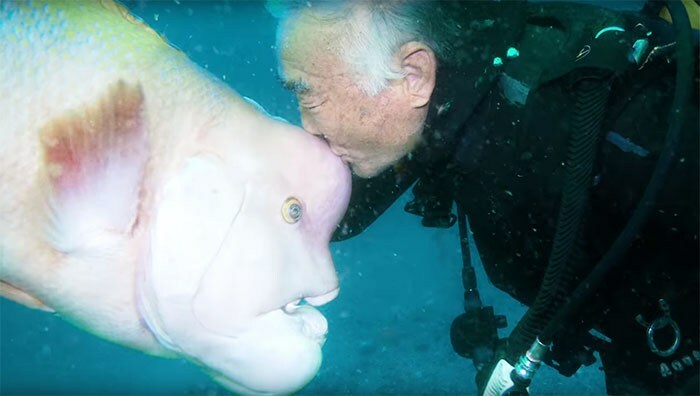 The bulging frontal lobe(the part where Hiroyuki kiss as a greeting every time they meet) of the fish may contribute to their facial recognition abilities. A test conducted by Oxford University proved that they can recognize human faces. This ability enabled them to develop a friendship with humans. The story of Hiroyuki and Yoriko was covered by Great Big Story in their Human Condition series. The series covers different inspiring, riveting and even strange stories around the world. Hiroyuki and Yoriko's story proved that friendship transcends boundaries.